Thursday before heading to the theaters, I watched Hellboy (2004). I also researched the character after seeing the remake the same evening. I wanted have a slight refresher. Although I went into the theater last night thinking Ron Pearlman was perfect for the role and thinking that no one could do it better, I came out appreciating David Harbour even more than I did before. I appreciate what he brought to the role, but more importantly I appreciated the film as well. Despite the far grittier nature of the remake than the original 2004 venture, the remake does something the Guillermo del Toro film does not. The remake lifts the horror right off the pages and forces us to endure it. 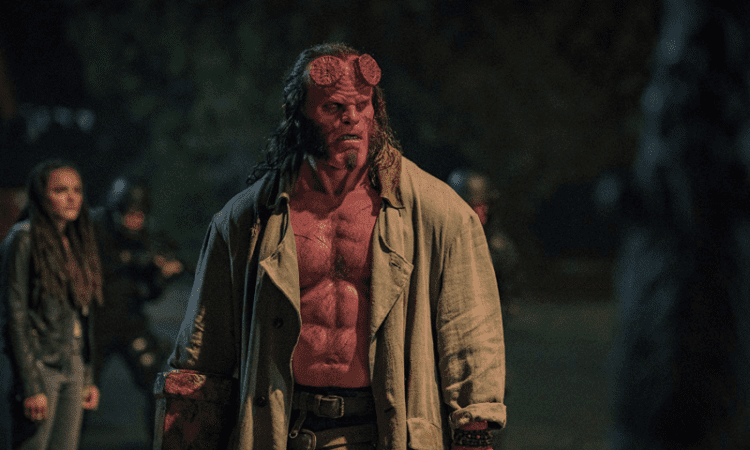 Neil Marshall’s Hellboy makes us examine who is really good and who is evil, but reminds us that the phrase don’t judge a book by its cover is one people should embrace far more often in life. Hellboy (2019) focuses on the lead character’s villain instead of opening up with the origin story of this so-called monster. Instead we are taken into the past. Audience arrive in the time of King Arthur and learn about an ancient evil. An evil that the kingdom had to destroy because Nimue (Milla Jovovich), The Blood Queen, desired to destroy England with a plague. Like most supernatural entities, The Blood Queen’s destiny was to rise again. This time she had an unexpected foe to battle in Hellboy (David Harbour). Despite feeling caught between both the supernatural world and his ties to humanity, Hellboy must take a true look inside his soul and decide ultimately who he wants to be. Much like before he does not have to take on this task alone, but sometimes it appears that he’s far better off taking on a lone wolf initiative. Despite knowing the film garnered a R rating, I still did not expect the copious amounts of gore riddled throughout the feature. However, I do not feel that the gore was for gore’s sake. At the end of the day, a war takes place within the film with various creatures. During war, or trying to protect the world, casualties occur. War is never beautiful so we have to see the grittier side of things this go around. Audiences needed a R rating in this instance, but with that comes imagery not for the faint of heart. Regardless, I feel that the violence used was a way to help guide the story along as all good horror films typically do not making the instances within the film much of a surprise. While not categorized as a horror film, horror elements are certainly featured within. The focus of the film is of course action adventure and fantasy, which means that the film had to rely heavily on special effects. The CGI used is fantastic. Even during the moments we wish the effects were not so realistic, from a technical standpoint I can appreciate the time and effort that it took to give Hellboy the look of a modern day world is under attack by a pending apocalypse. The effects lend themselves to the intriguing storytelling that builds in an authentic way. Some action films these days can make the task of watching them feel like a chore, but I felt nothing but eagerness to attain more information and see exactly how the story was going to unfold. Despite knowing the origin of Hellboy, I wanted to know more about him. I needed to know his story. David Harbour was a pure joy to watch on-screen. He brought a tenderness to the role that no one would expect. With a character like Hellboy, no one can truly imagine that a figure who is half demon would not have any bit of humanity in him. The demonic nature would take over, which is a theme they play upon rather well throughout the feature. Harbour does a terrific job portraying a conflicted and troubled protagonist and fills Pearlman’s shoes nicely. I look forward to seeing what he will do in future installments of the budding franchise and how the scene at the very end of the credits will come into play as well. Jovovich manages to bring sympathy for a character who deserves none, but ultimately proves her villainous nature and why she is a worthy foe for a reboot revealing many facets of the big red guy. Ian McShane (Professor Broom), Daniel Dae Kim (Major Ben Daimio), and Sasha Lane (Alice Monaghan) deserve credit too for their roles within the feature. They each provide insight into the true nature of the beast the world views as a monster. Overall, Hellboy accomplishes what it sets out to do. The film introduces the character to us as if we have no prior information and explains to us why this so-called beast is really a gentle giant. While cannot control certain aspects of his personality, we realize that in many ways he desires to do so. His goal is to fight for those who need fighting even if that means fighting against his kind. Though ultimately when viewing the rest of the creatures within the film one realizes that they have very little in common with him. While his life could have turned out differently, he shows that nurture how one can truly grow into something more. Nature does not always dictate the direction our life takes.